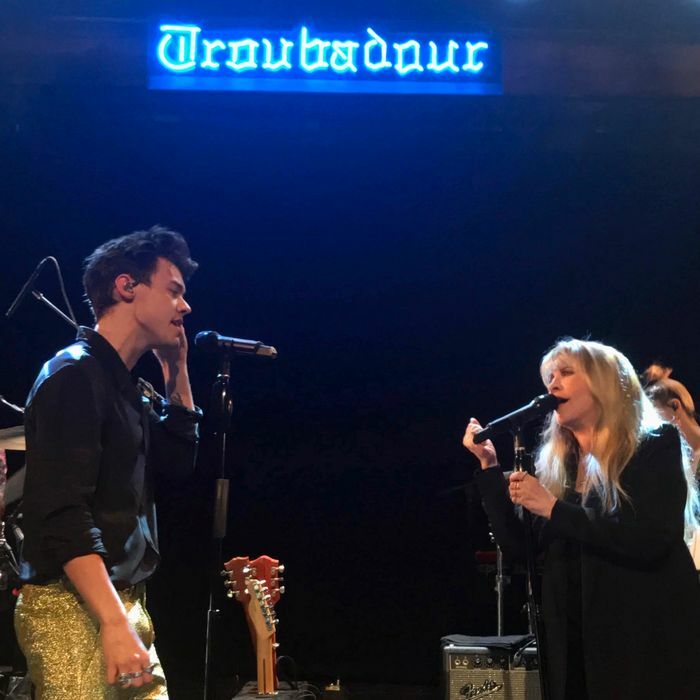 Twitter was a divided place after the Rock and Roll Hall of Fame announced its slate of presenters for the 2019 induction class, thanks to the polarized, and just plain confused, reaction to Harry Styles being picked to induct Stevie Nicks at the ceremony. Fleetwood Mac fans immediately sized up this little punk; One Direction fans generally had no idea what Nicks’s deal was; meanwhile, some well-informed music enthusiasts brought their meme A game. Whether or not the match makes sense — the two do share similar sonic paths, effortlessly transitioning from wildly popular bands to solo careers — the pairing isn’t actually as unexpected as it might appear on paper. On the contrary, the two have a (brief) history. Starting a few short years ago, Nicks and Styles have blossomed into what can best be described as a long-lost son and mother relationship, one you can only dream about with the help of too many melatonin tablets. (And/or crystal visions.) They’ve spoken admirably about each other in interviews, covered each other’s songs, and dabbled in a duet or two. It’s a newish relationship, but one that’s already brought plenty of joy. Here’s how it all happened. Styles, in a 2017 Rolling Stone interview, reminisces about how he calmed his nerves and prepared to meet Nicks for the first time, backstage at a Fleetwood Mac concert in London on her birthday in 2015: He brought some cake, baby! “Piped her name onto it. She loved it,” he said. “Glad she liked carrot cake.” Styles’s sister, Gemma, was also there, and shared a photo from the moment she met Stevie on Instagram afterward. Styles sporadically covers Fleetwood Mac’s “The Chain” throughout his tour. We’ll save you the annoyance of watching a shaky fan-shot video in favor of this smooth performance from the BBC Live Lounge. Styles is announced as the presenter who’ll induct Nicks into the Rock and Roll Hall of Fame as a solo artist. It’s unclear if Nicks personally selected her “adopted” son to do the inducting, but either way, it’s pretty clear she’s not likely to complain. And now, to await another duet!